With Abrosoft FantaMorph, you can do everything a professional animation director does to create amazing images and animations. FantaMorph supports most image formats including BMP, JPEG, TIFF, PNG, GIF, TGA, PCX, and even professional 32-bit with alpha formats. Exporting to Image Sequence, AVI, QuickTime, Animated GIF, Flash, Screen Saver, Standalone EXE and other formats are supported. You can crop, rotate, flip, adjust color, add caption or some cool effects for the source images and the final movie, all with FantaMorph's built-in tools, without having to go to any additional software. FantaMorph takes advantage of hardware acceleration, and the rendering speed easily goes up to several hundred FPS(Frames Per Second). The high speed makes it possible to play final effects in real time without exporting to a file. The new interface with skin is cool in looks, streamlined in function, and a joy to work with! The Pro/Deluxe edition supports creating multiple morph, which makes it a breeze to create long movies with multiple source images. You can also find some advanced tools like Feature Curve, Shape Curve, Master Curve, Track Curve, Camera, etc. in Pro/Deluxe to create professional, gorgeous and exciting morphing effects. Curve, Camera, Effect, Filter, Caption, etc. What can you create with FantaMorph? Beginning with version 3.5, you can easily create a sequence morph from a series of images. Beginning with version 3.5.5, you can create "Average Face" or various face composites with multiple face photos. Only available in FantaMorph Deluxe. Beginning with version 4.0, you can create more professional and amazing morphs than ever before by using the advanced morphing features: Track Curve, Camera, Filter, Sequence Effect, etc. Beginning with version 5.0, you can create Layer Morph that makes multiple morphs running in different layers simultaneously. Only available in FantaMorph Deluxe. Because morphing pictures and movies has never been easier and faster! 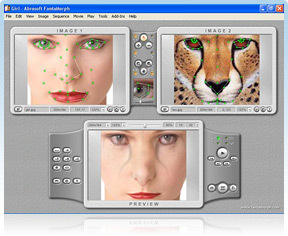 Abrosoft FantaMorph is based on a simple concept: a powerful and professional morphing software, yes, but simple enough to be used by even nonprofessionals. When tools allow for expression of creativity based on ideas and inspiration and not on technical expertise, everyone benefits. FantaMorph is so easy to use that you will be limited only by your imagination and your ability to create or obtain good material to morph. Make your own morphing movie! Unleash your creative spirits!